Since ESXi 5.1 it is possible to check VMFS for metadata inconsistency with a tool called VOMA (VMware Ondisk Metadata Analyser). With VOMA you can check VMFS3 and VMFS5 datastores. Please note, that the tool can only identify problems, as it runs in a read-only mode. So it does not help you to fix detected errors. If we want to scan VMLUN_01 we have to combine the Device Name (naa.60a98000646e6c…) and the partition number (1) with a “:”. Phase 3: Checking all file descriptors. Phase 4: Checking pathname and connectivity. Phase 5: Checking resource reference counts. What should I do if VOMA detects an error? The tool can only find errors – but not fix them. So if VOMA detects any errors, please consult VMware support for further help. 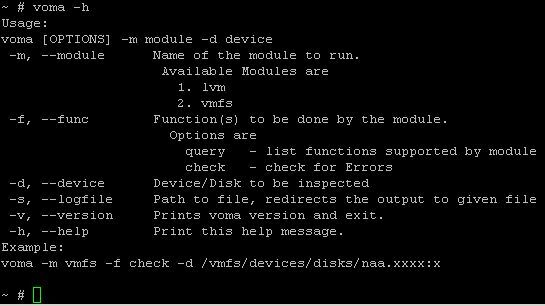 VOMA stops the scan, as there is activity on the VMFS filesystem. The MAC address indicates the management interface of the ESXi host causing the activity. Very nice post, thanks a lot. I have the following situation: VOMA detected several errors on my primary hardware-RAID disk. Unfortunately I cannot create a ticket on vmware support site. Can you point me to any direction how to correct these errors without data loss? This RAID had been re-build several month ago. I double checked hardware level – everything is ok.